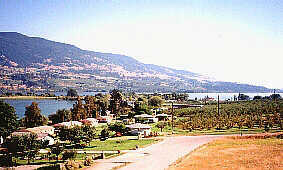 Nestled along Kalamalka Lake, picture-perfect Oyama is home to waterfront RV/campground resorts and busy fruit stands. Just 23 km (14 mi.) north of Kelowna on Highway 97, Oyama is close enough to the larger centre to access any of its facilities and services, although most of them can be found in Oyama. Accommodations: The area has numerous resorts and campsites as well as provincial sites. There are also a number of motels and inns in the community with lodges and resorts close by.